President and CEO of the Chamber of Commerce of Hawaii, Jim Tollefson, shares how the organization works closely with businesses in developing and maintaining a thriving commercial environment in the state. He talks about the Chamber’s initiative in lobbying against the Base Realignment and Closure (BRAC) list which would have shut down the Pearl Harbor Naval shipyard and caused “6000 jobs and an economic impact of a billion dollars each year”. Mr. Tollefson has been president and CEO of the Chamber since 2002 after being a member of the board for seven years while working for the Bank of Hawaii. He shares with us the many different NGOs put up by the Chamber since its inception 155 years ago, which includes Hawaii Visitors Bureau (now HVCB), Aloha United Way, Mental Health Association of Hawaii, and the blood Bank of Hawaii. The Chamber impacts the state of Hawaii by communicating the desires of the business community and help change issues. Hear more about this historic organization as Jim Tollefson talks about commercial optimism, business opportunities, and financial prospects in the state of Hawaii. James C. ‘Jim’ Tollefson was named president and chief executive officer of the Chamber of Commerce of Hawaii in May 2002. He came to the position with a long history involvement and leadership at the Chamber, having served as its Chairman in 1999-2000, a member of its Board of Directors from 1994-2001, and as a member of the Chamber’s Executive Committee. Prior to joining the Chamber of Commerce of Hawaii, Tollefson was executive vice president at Bank of Hawaii where he held various executive and senior management roles during his 14-year tenure. 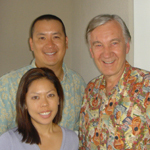 Prior to joining Bank of Hawaii in 1987, Tollefson worked on the mainland in management capacities at First Interstate Bank, Sanwa Bank, and Trans World Airlines. Active in community and charity organizations, Tollefson serves on the Chamber’s Military Affairs Council, the Board of Directors of the YMCA of Honolulu, the Hawaii Visitor and Convention Bureau (HVCB) Board, the Better Business Bureau (BBB) Board, the Hawaii Economic Development Corp. Board, the Oahu Workforce Investment Board, and the Hawaii Institute for Public Affairs Board. Additionally, Tollefson has served on various committees for state educational initiatives. He is past chairman and former member of the Board of the Hawaiian Humane Society, past corporate chairman of the Children’s Miracle Network Telethon, and a former member of the Board of Palama Settlement. Tollefson was born in Kansas and served as an artillery officer in the U.S. Army in Korea and Fort Sill, Oklahoma. He holds degrees in psychology and business admin¬istration from Kansas State University and suc¬cessfully completed studies at the Graduate School of Credit and Financial Management at Dartmouth College.